There's a moment in Super Mario Odyssey where the game distils everything it is, and everything it stands for, into a blow-out celebration. All at once the past, present and future of this grand old video game series smashes together in a freewheeling, spectacular and experimental set piece that shows that Nintendo, after years of having the handbrake on, is now absolutely flying creatively. To go into any more detail would risk venturing into spoiler territory, however, the freedom that this party, and the wider game in general demonstrates, is nothing short of intoxicating. As gamers who first got closely acquainted with the portly Italian plumber during the halcyon days of the Nintendo Entertainment System in the 1980s, it was a genuinely moving experience to see the series not only come full circle, but also triple-jump into the future with such gusto. This has been a landmark year for the Big N, with it very much going back to the future so to speak, and with spectacular results too, with arguably the strongest first-year lineup since the Nintendo 64 graced store shelves over 20 years ago. What Super Mario Odyssey almost revels in proving though is that Nintendo is not only just bringing back past glories, but it is building on them and taking them to wondrous new heights also, all the while showing literally zero fear in tearing up the rule book when it feels it is necessary to do so. And the biggest example of that lack of fear is demonstrated by what is, arguably, the star of Super Mario Odyssey - Cappy the cap. Far from following the accepted riff for a Mario game and building into each level a series of different power-ups, Odyssey ditches them all. Fire flowers, mushrooms, feathers, leaves and even stars, to name but a few, all are not present as power-ups in Odyssey, with Mario relying almost entirely on Cappy to progress through the game's worlds, who adorns Mario's head from the moment that his original is shredded by Bowser's airship within minutes of the game starting. Shredded, arguably, like Nintendo's decades-old how-to-make-a-Mario-game rule book. To compensate, Cappy is the most potent, versatile power-up the series has ever seen. Mario can throw Cappy to strike enemies in a variety of ways, utilise him as a stepping stone and spring board to jump off when tantalising platforms lie just out of reach, collect coins and powerups with him, disperse snow and cloud with him and, amazingly, use him to perform a selection of physics-defying new acrobatic moves. There was something else that Cappy can do as well and we've plumb gone and forgotten... hmmm, what was it? Oh yes! 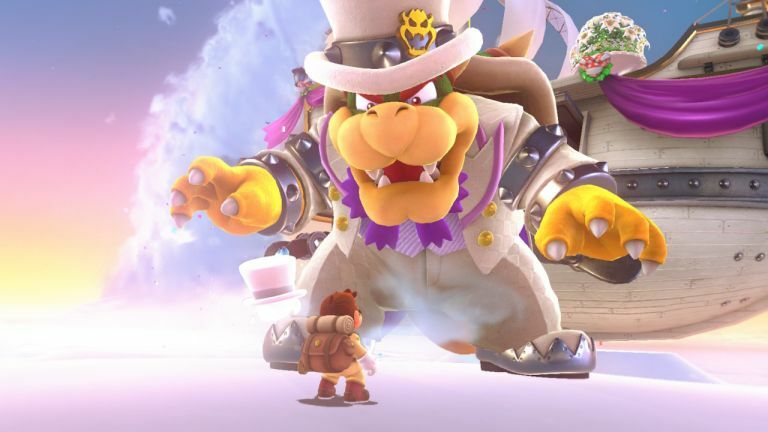 Cappy can literally possess the majority of creatures and objects in Super Mario Odyssey, transforming Mario into a moustachioed, almost always more loveable incarnation of them now equipped with their signature moveset and power. And as Nintendo has fully embraced Cappy as a mechanic, these possessions are not only normally crucial to progressing through the game, but they are also inherently tons of fun too (think Mumbo's transformations in Rare's classic 1998 platformer Banjo-Kazooie). The result is that while Mario certainly does get some time in the sun during Odyssey, for large parts of the game he isn't onscreen at all - well, at least not in plumber form - with Cappy transforming Mario into everything from an accordion caterpillar (the classic enemy best known from Super Mario World's Forest of Illusion levels) to a fully functioning jumbo-sized zip, and onto a cannonball-firing tank and more. And that's saying nothing of a certain scene-stealing moustachioed T-Rex. And be under no illusion, mastering Cappy's abilities is key to squeezing maximum enjoyment out of Super Mario Odyssey as, as the game highlights a few times when Cappy is taken from Mario, without the all powerful hat's powers you are pretty darn vulnerable in this game, no matter which of its lands your airship has parked up in. And lands there are a plenty in Super Mario Odyssey. Finally, after more than 20 years, Nintendo has delivered true open worlds for the player to explore, with Mario's airship, the "Odyssey", providing the means to travel to them. Not only are each of the lands Mario can explore open world sandboxes, with a vast number of power moons to collect (Odyssey's star-like main collectables) in, largely, any order the player desires, but they can be travelled to and from at will too, meaning that if you suddenly don't fancy exploring one land, you are but a short airship flight away from another. Each land follows a similar structure upon first arrival though, with each in poor condition thanks to Bowzer and his sidekick minions, the Broodals, sweeping through them ahead of you on their dastardly mission to see the kidnapped Princess Peach married against her will. So often your first port of call is to free the land from this yoke of tyranny before then proceeding to collect a minimum number of power moons in order to power the Odyssey to reach another destination. At certain points on your grand globe-trotting tour you are even given a choice of destinations to fly to next, betraying a commitment seemingly made by Nintendo to truly make this a free, open world experience. And you're going to need to revisit each land for sure as there are literally hundreds and hundreds of power moons to collect, costumes and souvenirs to buy (the latter neatly installed in the Odyssey for you to see), and secrets to discover. Even when you've 100 per cent-ed a land you'll almost certainly want to return again just to lap up more of Super Mario Odyssey's vibrant art style, admire its immersive audio, or freerun Mario - arms outstretched in joy - throughout its landscape, calling upon a moveset that has never been bigger, more tightly integrated mechanically, or more fun to use in the series to date. Mostly though, you'll be drawn in by Super Mario Odyssey's ability to, even when you think you've got the game sussed, surprise you with something new, something that you hadn't expected - and that comes from its inherent instability as a "Mario" game. The framework is there for sure, as too much of its staple content and gameplay, however, deep routed into its core is an almost off-beat jazz note of rebellious experimentation. For over two decades the ghost of Super Mario 64 has haunted this legendary series like Banquo at the feast, with even the most well-received new releases tarnished somewhat in comparison. Why Nintendo never properly followed 64 up tonally or in structure remains a mystery, although one wonders whether it feared it had tasted Coleridge's honey-dew paradise and felt it couldn't recreate the same magic again, now cruelly woken from a fabulous, right time and right place dream. Yes, the later Super Mario Sunshine and Galaxy titles tried to stick by and large to the same formula but, arguably, lacked the innovation and lightning-in-a-bottle creative brilliance that had produced one of the greatest video games of all time. Unsurprisingly, Nintendo then took the series back to its roots, with titles like New Super Mario Bros. and Super Mario 3D World playing it safe in a creative and financial fallow period, searching to re-affirm its identity but inevitably paling in comparison to past highs. With Super Mario Odyssey though those shackles have been spectacularly taken off and, all of a sudden, we've returned full circle, with a creative, experimental, riot of an adventure delivering not only that open world spiritual successor to Super Mario 64 that gamers never got, but also a title that renews and revitalises the series in some truly astonishing and wondrous ways. And that experimental revitalisation should be truly held in the highest esteem as it is so, so rare in the industry today. If you approached almost any other publisher and stated that you wanted to take its most beloved, established, cash-cow creation and create a title that revelled in the player NOT playing as that character directly, almost relegating him to a means-to-an-end side show, you'd be laughed out of the room. But that's exactly what Nintendo has done. Just as Mario's iconic hat is shredded and destroyed within minutes of the game beginning, Nintendo has also torn up the series' rule book and the results are quite simply spectacular. The fact that Super Mario Odyssey manages to be so experimental while also drawing in the best parts of every Mario game to date, becoming a incredibly playable and joyous love letter to gaming's most celebrated series in the process, is without doubt like a legendary Homeric odyssey - truly epic.